Isiah Factor | The Insite » IT’S LIKE HE NEVER LEFT LOCAL NEWS! IT’S LIKE HE NEVER LEFT LOCAL NEWS! February 7, 2007 | Posted in Uncategorized | Comments Off on IT’S LIKE HE NEVER LEFT LOCAL NEWS! Former KPRC reporter Chris Gutierrez was front and center on FOX news channel covering the arrested Astronaut story at NASA Wednesday. Chris is no longer a local yocal like The Insite – he’s moved up to the big time. 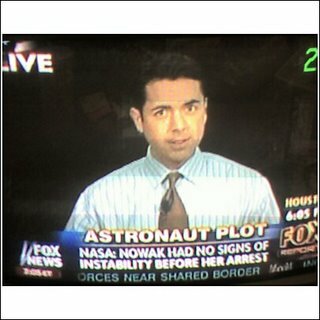 It was just last month when The Insite first reported the channel 2 reporter was going to work for the FOX News Channel. He will be the regional reporter handling areas like Houston, Dallas and New Orleans to name a few of his coverage cities. Good luck in the big leagues Chris!